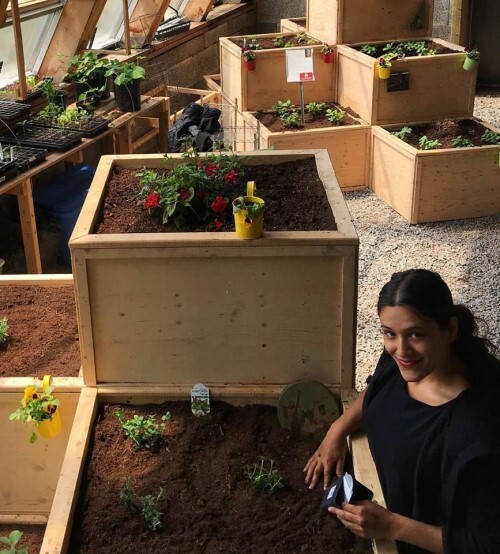 Hope Blooms member, Shaani Singh, recalls the day she took a different path home from school and discovered a community garden that would change her live. We are all seeds. We begin small, blowing in the wind, first floating, then flying gracefully until we land. A seed does not decide where it will land, whether it lands in an oasis or within a crevice of concrete. However, when a seed is nurtured, along with hard work, it has the potential to blossom. Every seed has a future. When we are young, we are oblivious to our surroundings: what we feel, see, and hear. As a child, poverty sometimes is masked through adventures and endeavors, forgetting our current situation through the joys of our youth. I remember the hot summer days, sipping the sweet indulging nectar from honeysuckle flowers. My memories are filled with trips to the store, buying ice cream with handfuls of nickels and pennies, and running through, over, and under the jungle gym of police tape with my brother. Living in the Avondale area low-income in Cincinnati, Ohio felt like a tale out of a storybook. However, it was my reality. As I grew older, my roots tried to grow deeper, but I felt confinements of economic and cultural limitations, akin to the feeling of being trapped in concrete. Living in this environment was the catalyst to me discovering and accepting who I am; a hardworking product of immigrant parents, living in the “hood”. At the ripe age of 10 years old, like a plant, I was transplanted from one soil to the next. In my case, I was moved from Cincinnati to a small city in Canada I could not even properly pronounce, Halifax. The Uniacke Square area of the North End of Halifax is characterized by poor educational outcomes, subsidized housing, high rates of drug use, and a largely marginalized population. It felt like we were moving backwards. Suddenly I was propagating myself in inner city apartment up north. The country was different, but the setting was almost identical. As a child your level of innocence and gullibility is so high, I believed the absurd tales, “there’s no such thing as summer in Canada…. There are penguins walking around”. My parents constantly reminded my siblings and I about the importance of family and community. I later realized how profound the truth of their words was. While walking from school one day, I decided to take a different path home. That moment changed my life forever. Having lived all my life stuck in soil labeled concrete, sprouted in the dark, I finally felt what it was like to see the sun. A young bald kid filled with ambition wearing an over-sized t-shirt and Rocawear jeans. I was enrolled at St. Patrick’s Alexandra School, and some of my peers after school would go to the community garden. Rather than going straight down the familiar rocky parking lot, I turned left near the park. As I walked further, like an oasis within the desert, a forest of petals, fruits and vegetables emerged, painting a mosaic of colors in the distance. This piqued my interest; even though gardening is not necessarily my passion, the entrepreneurial aspect intrigued me. At this time, I also met with the founder of the project, Jessie Jollymore. I realized that I could be a leader with many youth in this community by being a role model and instilling confidence in youth by helping them think about how to make a difference in our community. It was a garden named “Hope Blooms”. As I walked into the garden, I was handed a shovel, so of course I started digging. Gardening became my escape from violence, drugs, and deprivation; my shovel was my weapon of choice and beautifying the soil was my graffiti. I saw beauty in my community that I had never been privy to. At Hope Blooms, gardening is at our roots. We use gardening as a change agent. I learned that one man can plant a tree, but you need an army to grow a forest. 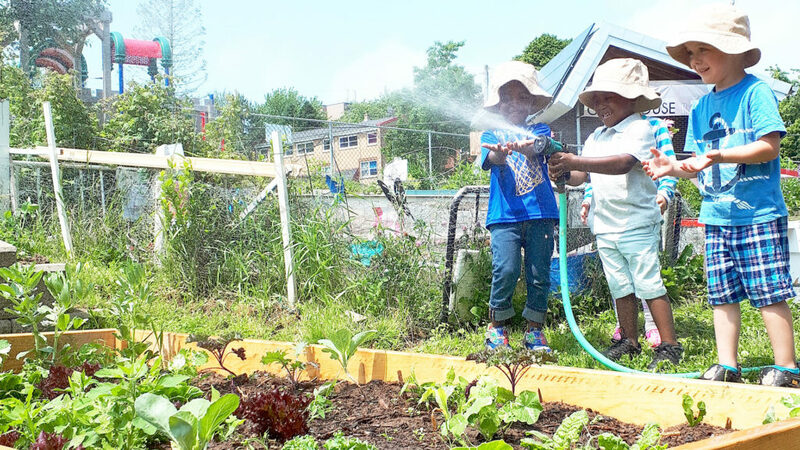 As I grew alongside the garden, I developed as a community leader. Today I mentor over 40 youth ranging from the ages of 6-14 and over 35 families, growing over have 3000 pounds of food this year. I believe that rather than it taking a village to raise a child, it sometimes may just take the children to raise the village. If you ever decide to one day walk down the sidewalk on Brunswick Street in Halifax, you will see us, a plant with roots tangled in concrete, my stem crowned with a small bud, ready to blossom to its true potential. Starts with a dream and a plan of action. By creating inviting spaces this encourages individuals to take action for your cause. The first time I turned over the soil in the Hope Blooms Garden was like cutting into the most beautiful mocha, chocolate cake. The garden was in its 7th (fact check?) year of growing and you could feel the nurture & nutrients that made up the ground we would grow food upon. The sacred soil, you may question why the soil is so sacred. For many of us it’s just dirt. When you start to really connect to where your food is coming from, there’s no way not to acknowledge the soil. For centuries land has been our livelihood. Our medicine, our daily practice of coexistence. Through colonization & the green revolution, people and traditional practices have been pushed to the sidelines. Away from health and biodiversity, towards greed and control. Just because something is taken from us, like our connection to the land. Doesn’t mean it isn’t there. 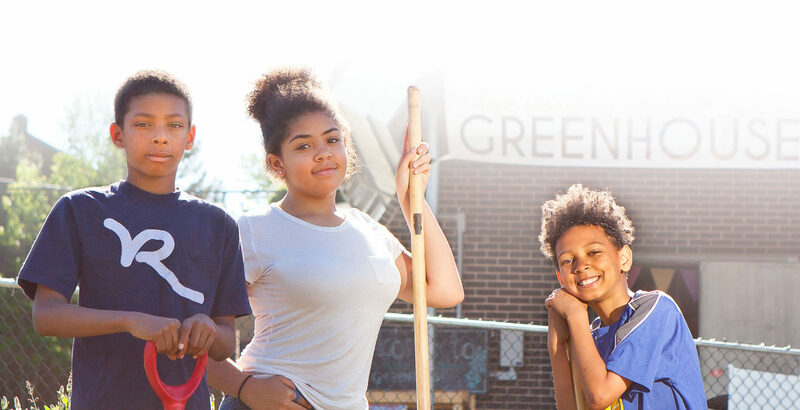 Bringing youth to the seed, to the soil, to the root, is what grows our connection to the earth. In the Garden we honour the fact that we are on unseeded Mi’kmaq territory, opening and closing each season with a smudging & ceremony from the elders of our community. Holding a fistful of soil in our hands we are not only carrying the past, & present, but also our future. The place that will keep us well, if cared for properly. The place we shall return when our time is done. We are moving towards a relationship with our food system that no longer knows what real food looks, feels, tastes like. We now make it justified to put chemicals on our crops and the environment, while giving major hoops for organic practitioners to jump through. When we tie ourselves back to the understanding that if we were all 10% of our own farmers, we would have overall basic food security needs met. By connecting to the soil, we connect to ourselves.